Tigerair Mandala has announced it is suspending operations from 1-Jul-2014, bringing to a close Singapore-based Tigerair Group’s highly unprofitable foray into other Southeast Asian markets. Tigerair is now turning its focus to its original Singapore operation, which has a stronger position and outlook but also faces short-term challenges. Tigerair Mandala has struggled since its Apr-2012 launch and had a weak outlook given its small size and lack of scale. Mandala’s demise was inevitable after its two main investors decided against recapitalising the carrier and failed to find a buyer. Mandala was by far the smallest of Indonesia’s four low-cost players. It becomes the fourth Indonesian carrier but the first Indonesian LCC to suspend operations since the beginning of 2013. This is the second and most likely final suspension for Mandala, which for nearly 40 years operated as a full-service carrier under the Indonesian air force. Mandala was initially privatised in 2006 and adopted the LCC model under the ownership of US investment firm Indigo Partners and Indonesian investment firm Cardig. Mandala quickly became Indonesia’s second largest LCC after Lion Air but it struggled financially, leading to bankruptcy and a suspension of operations in early 2011. Mandala relaunched in Apr-2012, using the Tiger website and reservation system, and adopted the Tigerair Mandala brand in Jul-2013. After a slow start, operating a fleet of only three A320s for the first seven months, Mandala accelerated expansion with six A320s being added from Dec-2012 to Jul-2013. At its peak Tigerair Mandala operated 26 daily flights across 19 routes, including 12 international and seven domestic. The carrier transported 1.9 million passengers in 2013, peaking at a monthly rate of 185,000 passengers. The earlier iteration of Mandala was entirely a domestic carrier and at its peak carried 3.6 million passengers. Under Tigerair, Mandala has focused more on the international market with Singapore by far its largest destination. Tigerair Mandala at one point served Singapore from five Indonesian cities and had about 24,000 weekly seats in the Indonesia-Singapore market. This amounted to almost 40% of the carrier’s total seat capacity. As expected, Mandala was unprofitable in its first year of operation as it focused on gaining market share as well as securing route rights and slots at Jakarta, where it benefitted from the Jan-2013 demise of Batavia. But losses accelerated over the past year as market conditions in Indonesia became more challenging due to intensifying competition and the rapid depreciation of the Indonesian rupiah. Mandala accumulated losses of about USD160 million in its first two years of operations (Apr-2012 to Mar-2014), including a loss of USD32 million in first three months of 2014. Mandala initially responded to the increasingly challenging market conditions in 2H2013 by postponing growth and keeping its fleet at nine A320s. The initial business plan envisioned a fleet of 12 A320s by the end of 2013 and 18 aircraft by the end of 2014. As the carrier continued to bleed, Mandala decided in Jan-2014 to cut capacity and restructure its network. In early 2014 it dropped 10 of its routes, resulting in a seat capacity cut of about 40%. At the time Mandala elected to keep its fleet at nine A320s, resulting in a significant reduction in utilisation levels. However in early 2014, the carrier cancelled an agreement it had signed in 2013 with SMBC to lease three additional A320s. As Tigerair Mandala cut its operation to the bare bones its two main shareholders tried to sell the carrier. Tiger Airways Holdings and Saratoga have clearly been uninterested in putting more capital into Mandala, viewing the carrier as essentially a lost cause. The initial hope was to maintain a small operation using the limited remaining funds until new investors could be secured. But interest in Mandala has been low as the carrier has such a small position in the Indonesian market with limited slots and routes. With Garuda looking to sell a 40% stake of Citilink, Indonesia’s second largest LCC, there is a less risky and more attractive option to investors interested in the Indonesian LCC sector. Citilink itself looked at and decided against buying Mandala, recognising Mandala’s small size meant it was of limited value and concluding that Citilink is better off growing organically. AirAsia, which is generally not keen to take over other airlines and in 2012 dropped plans to purchase Batavia, also decided against making a bid. With no potential buyers, the Tigerair Group and Saratoga made the wise decision on 18-Jun-2014 to pull the plug. There is simply no point carrying on given Mandala’s relatively weak position in the Indonesian market and challenging outlook. Several years of large losses would have to be stomached for the carrier to gain scale and become a significant player. Tigerair currently lacks the capital or strategic desire to cover such losses as the group itself is restructuring to focus on Singapore while pursuing growth in other markets through alliances rather than equity stakes in franchises. The Tigerair Group’s other troubled Southeast Asian affiliate, Tigerair Philippines, was sold to Cebu Pacific in Mar-2014. Tigerair held approximately 40% stakes in both Tigerair Mandala and Tigerair Philippines. If it were not for Cebu Pacific, which only paid USD15 million for Tigerair Philippines, the Philippine carrier would have faced the same outcome as Mandala. There was no such white knight for Mandala. See related report: Cebu Pacific becomes latest Tigerair partner. Can LCC alliances counterbalance AirAsia and Lion? Selling Tigerair Philippines and closing Tigerair Mandala draws to a close a difficult phase in Tiger’s history. Tigerair, which launched operations in Singapore in late 2003, has always held ambitions to become a regional player. But in its early years the group encountered repeated setbacks in trying to establish affiliates while other groups, most notably AirAsia and Jetstar, raced ahead and successfully entered several Asian markets. It was not until 2012 when Tigerair finally was able to complete investments in Indonesia and the Philippines. But Tigerair should have walked away from both deals and recognised it was too late to join the party. At the time the Philippines had five LCCs while Indonesia had three strong LCC players (Lion/Wings, Citilink and Indonesia AirAsia). First mover advantage in both markets had long been sewed up by Cebu Pacific and Lion respectively while AirAsia, as a much larger and stronger LCC group than Tigerair, was better placed to be number two or three. Tigerair is now wisely and finally dropping its pan-Asia strategy. The group still has a 40% stake in Tigerair Australia, which was launched in 2007 and was only pursued after the group failed to establish affiliates in any Asian market, and a 10% stake in new start-up Tigerair Taiwan. But it is taking the back seat in both these projects and assuming a new “asset light” strategy while it focuses on turning around Tigerair Singapore. Tigerair Singapore has struggled over the past year as it rapidly expanded, resulting in over-capacity in the Singapore market. This in turn has impacted load factors, yields and profitability. But market conditions in Singapore should improve over the next year as Tigerair Singapore has halted expansion. In Mar-2014 it announced it was cancelling nine A320 orders that were slated to be delivered in 2014 and 2015, many of which would have ended up in Singapore, exacerbating the over-capacity situation. Tigerair instead committed to ordering 37 A320neos, which will be delivered from 2018 and used as replacements rather than growth aircraft. In the meantime Tigerair no longer has any commitments to additional A320ceos. The Tigerair Group has not said what will happen to the last four aircraft at Mandala, which will have to be returned to Tigerair after the 1-Jul-2014 suspension. But most likely these aircraft will also be sub-leased or sold, joining the five ex-Mandala aircraft which are now in the process of being moved to Pakistan Airlines International. Tigerair Taiwan could also be an option but the start-up has indicated that its aircraft would be sourced independently after the first A320, which was recently delivered from the Tigerair Group ahead of the start of proving flights. Tigerair Taiwan is expected to launch operations in 4Q2014. Tigerair still has huge challenges to overcome. But the group's outlook is much brighter without distractions in other Southeast Asian markets. Singapore Airlines' increased involvement in Tigerair, with SIA veteran Lee Lik Hsin taking over as Tigerair Group CEO in May-2014, also should help Tigerair right the ship. SIA owns about a 40% stake in Tiger Airways Holdings. Tigerair is the leading LCC in the Singapore market, with about a 9% share of total capacity and about a 30% share of total LCC capacity. Tigerair is a critical component of the Singapore Airlines Group brand matrix, which also includes full-service regional subsidiary SilkAir and low-cost long-haul subsidiary Scoot. Tigerair Singapore is particularly critical for Scoot, which is 100% owned by SIA and needs feed from Tigerair to successfully implement its long-term business plan. 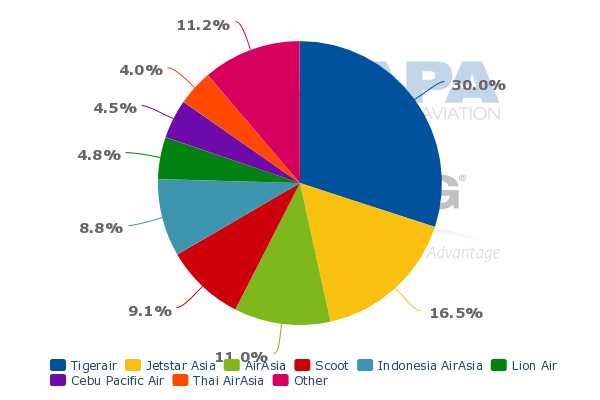 Scoot and Tigerair currently account for almost 40% of the Singapore LCC market. Mandala’s suspension is a blow to Tigerair’s position in the Singapore-Indonesia market but this could be partially recovered through an increase in Tigerair Singapore flights. Indonesia is Singapore’s largest market, accounting for about 16% of total seat capacity. But the roughly 40% increase in seats in the Singapore-Indonesia market, recorded since a new bilateral agreement was forged between the two countries in early 2013, resulted in over-capacity. While the Singapore-Indonesia market continues to expand, the growth in demand has slowed recently as Indonesian visitor numbers in Singapore have dropped due to the depreciation of the rupiah, which has impacted the spending power of Indonesians in Singapore, a popular shopping destination. The depreciation of the rupiah also increased costs for Indonesian carriers, impacting all Indonesian carriers as most of their fixed costs are in US dollars while fares are in local currency and could not be raised easily due to local air fare regulations and the intense competition. The largest LCC in the Singapore-Indonesia market, Indonesia AirAsia, also recently decided to cut capacity to Singapore by about 30% by cutting one route and reducing capacity on three others including Singapore-Jakarta. In early 2014 Mandala dropped three of its five Singapore routes and in Apr-2014 it cut Singapore-Jakarta to only two daily flights. Mandala currently has four daily flights to Singapore, two to Bali and two to Jakarta. In late 2013 the Tigerair Group had the equivalent of 18 daily flights between Singapore and Indonesia, giving it about an 18% share of the market. Once Tigerair Mandala suspends operations on 1-Jun-2014, the Tigerair Group will be left with only six to seven daily flights in the market, giving it about an 8% share. The group will offer only an average of three daily flights to Jakarta (the schedule varies depending on the day of week and month) compared to eight to nine daily flights in late 2013. The Tigerair Group will only continue to serve three secondary Indonesian destinations from Singapore – Surabaya (12 frequencies per week), Bali (six frequencies per week) and Bandung (five frequencies per week). Tigerair Singapore recently withdrew from Lombok and Yogyakarta while Mandala has already withdrawn from Singapore to Medan, Pekanbaru and Surabaya and also previously served Singapore-Padang. Additional Indonesia flights from Tigerair Singapore are possible to partially fill the void by Mandala. But Tigerair Singapore says for now there are no plans to add flights to Indonesia. As Mandala held Indonesian carrier traffic rights and Indonesian carrier slots, the flights cannot simply be transferred. Tigerair Singapore would have to make its own applications for traffic rights and slots, which could be tricky to secure particularly for Singapore-Jakarta. Following earlier airline suspensions, Indonesia reallocated Jakarta slots and routes to other Indonesian carriers. Some of Mandala’s routes and slots were inherited from Batavia, which had been Indonesia’s fourth domestic largest carrier after Lion, Garuda and Sriwijaya. As Mandala now also exits the market, the leading players – the Lion, Garuda, Sriwijaya and AirAsia groups– will be the beneficiaries. There are still several smaller carriers in Indonesia but none have sufficient scale to take on the main players. This is the lesson Tigerair Mandala learned the hard way and others would be smart to not make the same mistake. Smaller regional carriers have also repeatedly failed when they have attempted to expand into more mainstream routes. It is more sensible for these carriers to keep focusing on their niches and serving the hundreds of smaller markets in the vast archipelago that are outside the radar screen of the big guns. The four causalities since the beginning of 2013 – Batavia, Merpati, Sky and Mandala – combined accounted for almost a 20% share of Indonesia’s domestic market. But their void has quickly been filled as the Lion and Garuda groups have been expanding rapidly. At its peak Tigerair Mandala only accounted for slightly more than a 1% share of the domestic market. It struggled to compete against the bigger carriers on trunk routes such as Jakarta to Surabaya and Bali, which it served with a very small number of frequencies compared to its competitors. Smaller un-served or under-served niche routes such Yogyakarta to Palembang and Pekanbaru (which are among Mandala’s last routes to be cut) were relatively more successful but Mandala’s overall small scale made it virtually impossible to sustain. 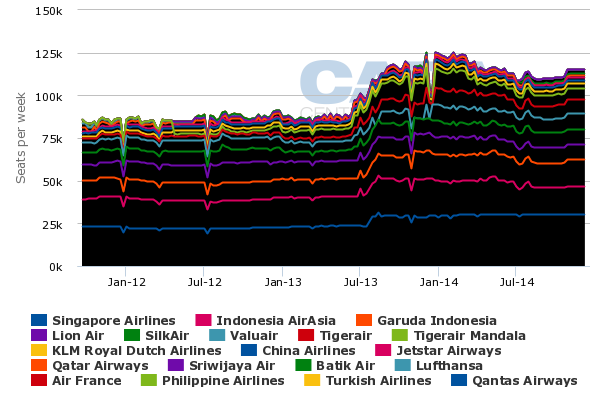 Consolidation in the LCC sector in Indonesia and the broader Southeast Asian market, where there are currently 48 carriers with several more to launch in 2H2014, was inevitable. Mandala will not be the only casualty.